The Architectural Engineering research facilities include 4 separate full-scale experimental laboratories located at the Bowen Lab of Civil Engineering. All facilities are used for research and education in high performance and energy efficient building design and operation. The labs consist of several room-scale test spaces to study the combined impact of envelope/facade, lighting and thermal systems and controls on energy performance and indoor environmental comfort, including renewable energy technologies. The Façade Engineering laboratories include two side-by-side, outdoor full-scale test office spaces (20ft x 20ft x 14ft high) equipped with reconfigurable elements (curtain wall, glazing sections/systems, lighting systems, ceiling panels, etc.) and flexible façade, shading, lighting and thermal controls. In this way, different products, materials, technologies and control strategies for perimeter building zones (glazing, shading, lighting, HVAC) can be easily tested and improved. Except for comparative testing of building technologies under real weather conditions, the facilities are used for accurate and realistic assessment of facade design and control options on energy use, indoor conditions and comfort indices. They can be used as test beds for occupant-based studies (occupant surveys and human interactions with building systems). 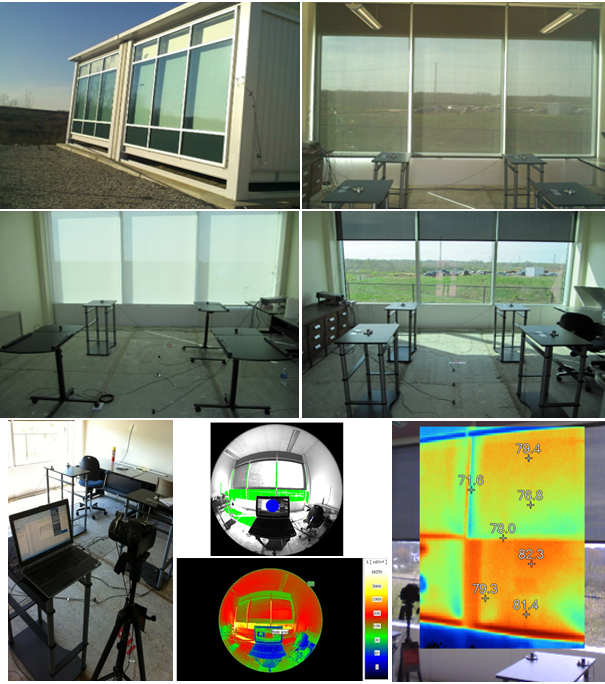 The offices are equipped with state-of-the-art technologies for measuring the thermal and visual performance of different systems. Equipment includes interior/exterior solar, daylight and temperature sensors, air velocity meters, globe temperature meters, infrared and HDR cameras, data acquisition and control systems, power and heat flow meters, custom lighting fixtures and controls, automated shading attachments, innovative daylighting devices, automation capabilities and computing/software facilities. 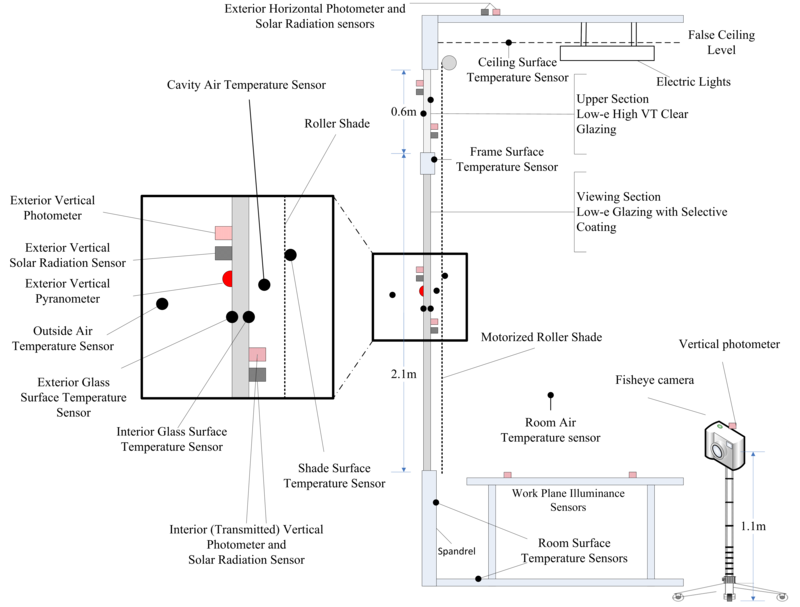 This lab consists of a three-zone building. 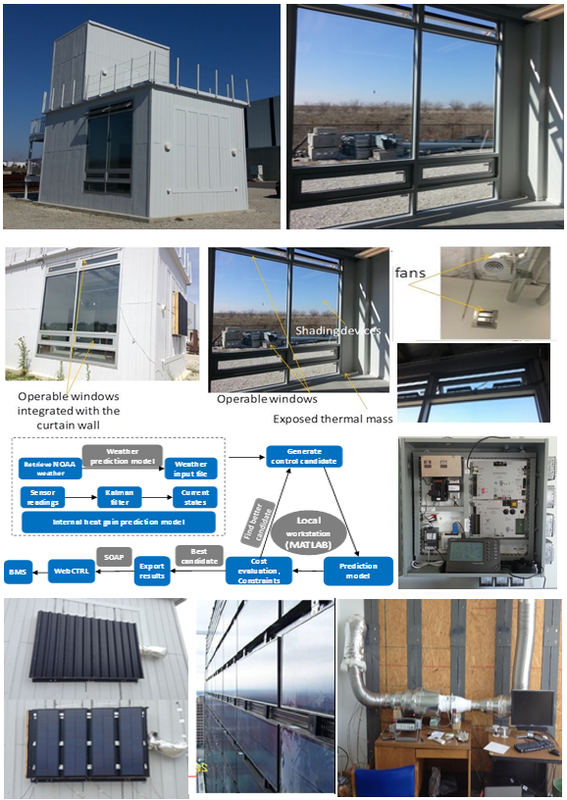 The facility is used for testing new concepts for energy and comfort delivery, such as photovoltaic-thermal systems, hybrid ventilation, mixed-mode cooling, as well as advanced controls. The entire south wall is reconfigurable with insulated panels and renewable energy technologies integrated on the building envelope. The roof is equipped with infrastructure to support the installation of different configurations with photovoltaic panels, solar collectors and photovoltaic-thermal systems. The lab includes a high performance curtain wall construction with shading control and integrated motorized vents for mixed-mode cooling. The concrete floor has high-level of exposed thermal mass and the open ceiling can facilitate various air-delivery configurations. 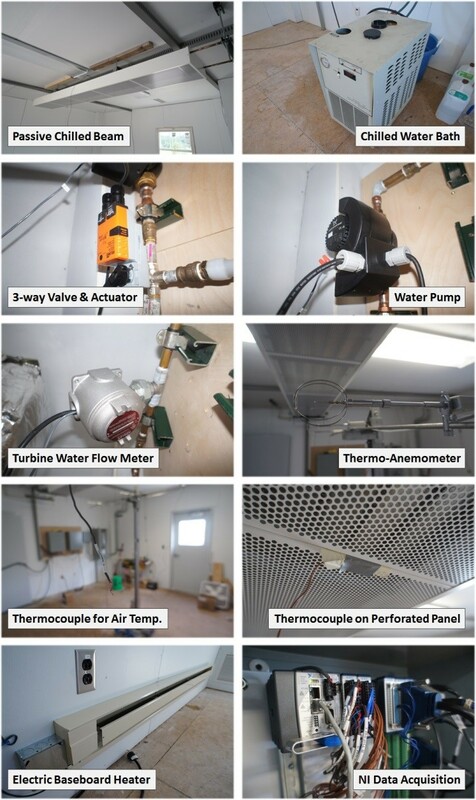 A split-type HVAC system is presently installed but the existing infrastructure and reconfigurable layout enables the installation of other air and hydronic comfort delivery systems. The facility is equipped with a weather station, variable speed fans, numerous sensors (e.g. temperature, solar radiation, laminar flow element, pressure transducers, high and low-velocity meters, energy meters, DC current meters, etc), data acquisition systems, and integrated control infrastructure. A key feature of the facility is the hardware, software and communication infrastructure to prototype and test model-based predictive control strategies for various energy and comfort delivery systems. The three-zone building allows for controlled research on the transport of outdoor air pollutants, including nanoparticles (or ultrafine particles), bioaerosols, and reactive gases (e.g. ozone), across the building envelope under various natural ventilation configurations. Additionally, an outdoor air monitoring station will be created on-site for long-term, continuous monitoring of selected airborne pollutants in the West Lafayette area. The test system mainly consists of N-S oriented compound parabolic concentrators (CPCs), a variable frequency drive (VFD) pump, a fan coil unit, an absorption chiller, and a data acquisition system. 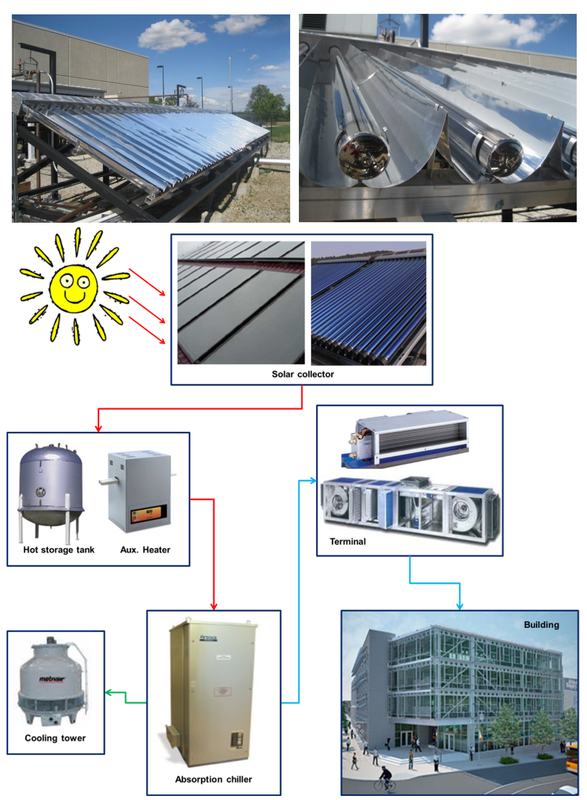 The CPC arrays collect solar energy and raise the temperature of the heat transfer fluid up to 190°C. In the meanwhile, the fan coil unit and the absorption chiller are used with PID-controlled three-way valves to maintain a steady inlet temperature of HTF. The flow rate can be controlled by the VFD pump. All the outdoor conditions and operation conditions are recorded by the data acquisition system, including ambient temperature, ambient humidity, direct and diffuse solar radiation, wind velocity, inlet and outlet temperature of HTF, HTF pressure, and mass flow rate.